There is demand and interest in growing non-woody plants in playground mulch in and around play equipment, including fall zones. This planting allows playgrounds to look more natural and to reduce the open, bare appearance of equipment in mulch, without compromising safety. This trial has the potential to greatly increase the amount of plants used in the landscape in Australia and New Zealand into the millions. Incorporating plants into playgrounds forms a more attractive and stimulating environment than mulch alone, which benefits children using the playground in numerous ways. Plants also increase the biodiversity of the playground, enhancing it as a natural environment. Ozbreed, in conjunction with Fiona Robbé Landscape Architects, The Hills BARK BLOWER and Acousto-Scan investigated planting techniques to use when incorporating non-woody plants within the surfacing around play equipment. Two planting methods were trialed to ascertain optimal conditions to achieve robust plant establishment and growth. 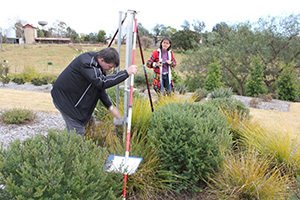 Two plant varieties and two planting methods were trialed in two types of playground mulch. Three sizes of plants were used in the trial: 140mm, 200mm and 300mm diameter pots. The area was monitored for three and a half years from 2010 to 2014. In this period two Critical Fall Height (CFH) tests were undertaken to ascertain the impact attenuation properties of the mulch surfacing, in accordance with the Standard test method AS/NZ4422:1996. This resulted in positive findings and recommendations which confirm that plants can be grown in mulched fallzones, and provide complying impact attenuation properties. The trial is ongoing. That plants can be used in fallzones of play equipment of any height up to 3m (within the requirements of the Australian Standards). It is recommended to check the CFH of the planted area every 3 years when mulch areas are also tested. The following is recommended best practice based on this trial to comply with AS/NZ4422:1996 and promote best possible plant health and growth. Plants should be placed judiciously in fallzones – they should not be planted where they may become trip hazards, but rather be used to the side of anticipated trafficked areas. If selecting plants other than Tanika® Lomandra or Naringa™ Westringia, plant species should be carefully selected not to pose hazards to children eg choking hazards, toxicity, thorns, etc. Fertilising of plants in freshly laid mulch will aid the initial establishment of the plants as there is little competition for the required nutrients. More on plant variety selectionThe soft clumping Tanika® plants grew particularly well and would be a variety recommended for planting into a fall zone area of a playground. It is important to note that although Naringa™ plants passed the CFH tests, the branches could present a hazard if a child fell onto this shrub so it is not recommended to use in immediate fall zones, but can be used in the edges of fallzones. Note: Since the trial commenced in 2010 small forms of Westringia including Mundi™, Grey Box™, Low Horizon™ and Ozbreed Aussie Box® are now available. These require less pruning than Naringa™ and could be planted on the edge of the fall zone to provide contrast and interest from both their foliage and plant shape. It can be extrapolated that other fine leaved grass-like plants similar to Tanika® Lomandra, with its soft foliage, could be anticipated to perform well in fallzones. For example, the Lomandras Shara™, Variegated Tanika™ and Tropic Cascade™. It must be noted Lomandras such as Nyalla®, ‘Katrinus’ and Sungold™ that have spiky leaf tips or spiky flowers would not be suitable. Other grass-like examples include Little Jess™ Dianella, Sweet Mist® Phormium, and Liriopes Just Right®, Amethyst™, Isabella®, Silverlawn™ and Pink Pearl™. Soft groundcover plants and small shrubs could also be anticipated to perform well in fallzones. Selections that don’t get too woody, do not produce seeds or other choking hazards, and do not attract lots of bees are recommended. For example the Nandinas Blush™, Flirt™ and Obsession™ would be suitable as they have not produced berries. Callistemons would not be suitable as the flowers would attract too many bees and the seed could become a choking hazard. For full details of the trial, download the following pdf files.